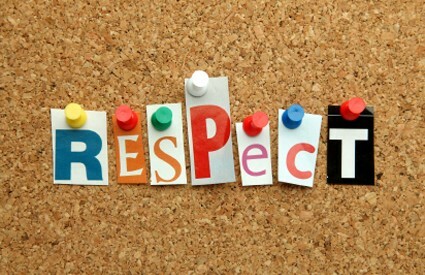 By Arwen McGilvra- When teaching your child to be respectful it’s important for them to know what to respect. There are three essential areas of respect for every child, if you are religious you may feel the need to add a forth area to my list. #1 Yourself– kids need to know to respect themselves, both their bodies and their person hood. Respecting your body includes not doing anything you know will endanger you. That includes everything from smoking, to drunk driving, to choking yourself, to jumping off the top of the playground on a dare. It’s also means caring for your body by eating right, brushing your teeth, and grooming. Respecting their person hood means that they don’t say mean things about themselves, they don’t make jokes that put themselves down. Additionally it means they seek out people who build them up. That can mean they have to walk away from friends who put them down. #2 Others– This the the one we most often think about when we hear respect. Mostly it boils down to being kind to those around us. Taking turns, not saying mean things, sharing, waiting in line, keeping your hands to yourself, knowing when to be quiet, etc. That list could go on and on, but I’m going to guess that respecting others is probably the area of respect you are most familiar with, and skip ahead to the next area. #3 Property– This isn’t necessarily tied to respecting others. Think about going to a public place like a park. Who can you point to and say don’t smash that flower because it wouldn’t be respectful to them. With small children adding property to the list when you talk about respect is especially helpful. Respecting property means you don’t take things that don’t belong to you, you ask before you borrow something, and you take good care of it while you are borrowing it. It means you don’t trash or vandalize things. You would be surprised at how many children don’t know not to write on bathroom walls. They see other graffiti and assume its okay. In a group setting it means that you use items as they were meant to be used. At the daycare that’s not using the blocks as throw toys. It’s also taking care of shared items. You don’t bend the pages of a library book. And it means putting these back where they belong and nicely. A preschooler playing with a puzzle can put all the pieces back in place and return it to the puzzle shelf to show respect for their shared property. I’m not advocating for you to sit your child down and make a huge list of things to respect. What I’m saying is that they can better understand respect by understanding these 3 areas. So next time they stick their mouth on the glass display case and you tell them not to do that, you can add some guidance by saying that’s not respecting property and others who want to look at the display.